Heads up comedy lovers, the suits at TNT have done something right, as in, choosing to renew “Claws” for a second season. It’s a dark comedy that made heads turn, in year one, marking it as the highest-rated series to launch on the rebranded network. TNT’s EVP programming Sarah Aubrey, calls the comedy “hilarious” and applauds the series for representing diverse voices. Created by Eliot Laurence and executive produced by Will McCormack and Rashida Jones, “Claws” follows the hilarious and complicated women at Nail Artisan, a southern Florida nail shop that is used to launder money for the Dixie Mafia. It’s owned by the vivacious Desna (Niecy Nash) who dreams of getting out of the dirty side of the business. The harder she tries to go “straight” the more dangerous her life becomes. Claws also star Jenn Lyon (“Justified”), Carrie Preston (“The Good Wife”), Karrueche Tran (“The Nice Guys”), Jack Kesy (“The Strain”), Kevin Rankin (“Breaking Bad”), and Harold Perrineau (“Lost”), and Judy Reyes (“Scrubs,” “Devious Maids”). 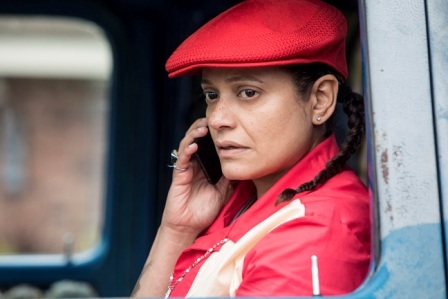 I caught up with Judy Reyes who plays the character Quiet Ann—a butch lesbian who is, well, almost silent with the characters unfiltered inner dialogue providing a lot of the comedy as well as her own shocking backstory. Black don’t crack and in Reyes’ case, at 50 years young, she almost makes a person do a double take on the age tip. You know Mrs. Reyes work I am sure. She is best known for appearing as Carla Espinosa on the NBC/ABC sitcom “Scrubs” (2001–2009), and as Zoila Diaz in the Lifetime comedy-drama “Devious Maids” (2013–2016). Here is an edited interview with Ms. Reyes who considers her career in television a blessing, that keeps on giving. L.A. Watts Times (LAWT): I fell in love with the character, Quiet Ann. Your body language, Mrs. Reyes is superlative. In viewing the episode that focuses on Quite Ann, history before the nail salon, it was an eye-opener. When did you find out about the twists? There are a lot of spoiler alerts that I can’t share in this question, gosh! Judith Reyes (JR): (Laughing) Thank you. You are right. There are a lot of spoilers in answering that question. Umm. I can tell you why they choose to write the episode. At the end of the first season, the fans made it clear that they wanted to know more about Quiet Ann, and TNT listened. The writers actually had already discussed going into the mind of Quiet Ann. We figured the way they ended last season with her major heartbreak, that was the way to start to explore her. LAWT: She is building a lot of the excitement into the season. JR: You are right and for her, a lot of things are just really piling up, so she’s trying to keep it all together …until she just blows up. LAWT: (laughing) Until she blows up. Gosh, I loved that scene. Amazing. And yo look so different, glamorous. Where did this major change come from? JR: Again, I give a full nod to the writers [Eliot Laurence, Will McCormack, and Rashida Jones]. They did a great job of piling it on, and when her family just shows up out of nowhere, it’s like, f—$! me. You know what I mean? LAWT: I know what you mean, of course, I do. In the show, you play Cuban. Right? LAWT: You have a background in theater, that makes sense. I can see it in your work in “Scrubs,” and of course, in “Claws.” My favorite episode is season one when you are dancing with Anne. It’s so tender and I could not stop watching that simple scene. JR: Thank you, as inspiration, I used my father. As a Dominican, you grow up dancing, and I would watch him and that’s the inspiration that you saw. Thank you, again for that compliment. LAWT: Why do you think Ann is so loyal to Desna [Niecy Nash]? JR: Well, not a lot of businesses will hire an ex-con and my character is an ex-con. So she feels an incredible debt to Desna. She rescues her and then I rescue her. We rescue each other. LAWT: What’s next for Quiet Ann? Personally, I think she should have her very own show. Or, if not an entire show, a six-episode special where we go into her world. Thoughts? JR: (laughing) Ok, to answer the first question, she’s pursuing her relationship with Arlene, and dealing with the changes in the salon, a situation. That’s all I’m allowed to give you. To answer the second question …. um …. thank you for enjoying the character so much. LAWT: Last question, describe your dream vacation, please. JR: A trip to New York watching theater. I want to catch up on everything that’s going on in the theater. LAWT: Beautiful. I have some ideas. I will email your hard-working public relations team with suggestions, and then perhaps an in person for a second interview. JR: I would love that. Claws airs on Sundays at 9 p.m. ET on TNT.